We are proud to announce that we have a working implementation of a built-in uploader for Picasa web albums. I personally like the Picasa service, because they are one of the few gallery providers that have high quality scaling of their images. Most other providers either have fixed sizes of their images, or use a Flash-based viewer that has a blurry bilinear scaler. 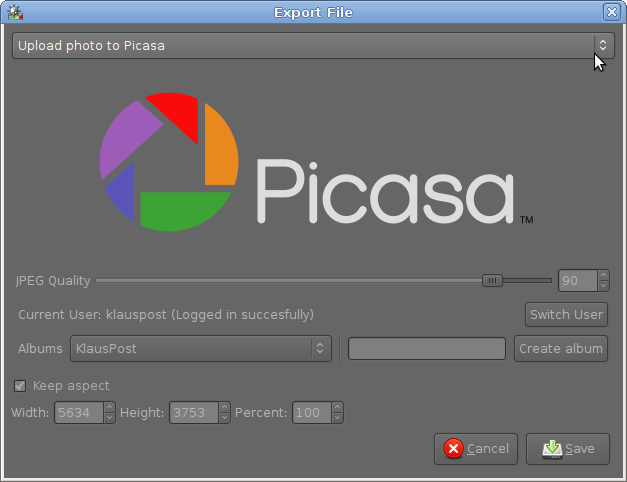 So for those of you who also like the Picasa webalbums, you can now easily upload your images with a single click. For those of us who couldn’t care less about Picassa, Flickr and Facebook… could you guys either focus on the RAW functionality first, or create a separate fork of the project with all the more external bells and whistles? This may seem like a harsh comment to make, but you must understand the concern. You have an excellent starting point – the only RAW converter on Linux that actually does the job, all others are a disappointment. But it’s discouraging to note that, just like the others, you’re even at this early stage starting to go outside the RAW conversion domain and started putting in non-essential functionality. I’m afraid you might squander what is so good and *promising* about RAWStudio. Well, with all due respect, you are not the only user of this software, and for some people it is important to have a workflow where you can quickly share your images. Of course, Klaus, point taken. I hope you understand I mean well and want the best for your project. You see, I make a living from photography, and right now I’m in the middle of a bold step: switching from Mac to Linux. In the context of rather idiosyncratic, oddly implemented solutions available to me on this new platform, RAWStudio is a welcome exception. You have a very viable starting point and your improvements for 2.0 are spot on as well. So as a professional user I want to be sure my voice is heard. Please consider the implications: if you can get and retain professional users, then the consumers will follow too. I think you’re on the right track, so best wishes with the work. Any idea of a (provisional) release date for v. 2.0? It would help me plan a little.